Matisyahu continues to impress me with his newest acoustic tour and I can't possibly imagine what he will come up with next. I had the opportunity to attend "An Acoustic Evening with Matisyahu featuring Special Guest Levi Robinson", a sold out show in Annapolis, MD at Rams Head on Stage. 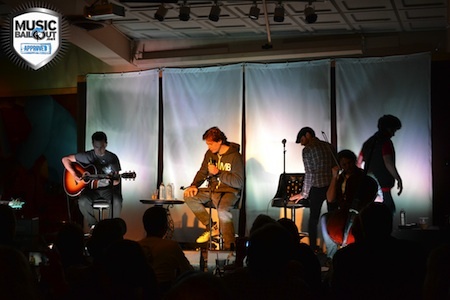 His acoustic show was that of none other I had seen with an acoustic, classical, dub, reggae vibe. Backing him was two guitarists, one of which was Dave Holmes of Dub Trio, as well as Brian Gibson on Cello. The guitarists had a combination of effect pedals, used very tastefully in combination with the deep bass thumping and light melodies on Cello and Matis' lyrics and beat boxing to give that special ambient, almost spiritual feeling in his music. His lyrics, his message, is so clear, one of inspiration to seek the spark within. One thing I've always liked about Matisyahu is how he surrounds himself with good musicians and simply good people whom he works with to inspire and make a difference. I am a friend of his personal vegan chef during this and the last tour, Jack Fivecoate, who is also a fellow Reggae musician with a conscious message and great person in general. You can follow Jack's blog at http://whatdoesmatisyahueat.tumblr.com to see what Matisyahu has been eating on his tour. I was also able to briefly meet Levi Robinson who is a young up and coming, unknown talent, recruited by Matisyahu to join him on the acoustic tour. Levi is a smaller man with a large beard and very kind smile. As Levi walked on stage he lightly said hello and began to play beautiful folksy melodies on his acoustic guitar. After he warmed up, he began to sing with an extremely powerful soulful voice that was shocking and mesmerizing. Levi has a style that sounds a bit like Mumford and Sons with a folk, rock, even ambient twist and each song was filled with a powerful message or a story of his life. During his performance the audience was remarkably quiet and erupted into claps as soon as he finished. As was the case when Matisyahu stepped out as well. The venue did a great job of setting the ambiance with white elegant backdrops and a light set up that seemed to flow with the songs, changing vivid colors and adding to the mellow atmosphere. A clean shaved Matisyahu came out and greeted everyone warmly in some comfortable attire and a big smile. He started off with a strong song, "Crossroads" and again everyone in the crowd was speechless, taking it all in, bobbing and tapping, until the last note stopped ringing and they suddenly burst into cheers and claps. Both guitarists backing Matisyahu did a great job of adding an ambient background for him to work with using delay, reverb, as well as reverse sampling and other great effects throughout the show. Watching the musicians work was like watching a great chef, concocting each recipe perfectly with hints of spice and dub. The set was a great mix of new songs off his latest album, "Spark Seeker" and some of his old hits with a new twist on them such as "Jerusalem". Conquering the musical aspect with a genre blend I've never even heard before is not enough for Matisyahu. He took it a step further to create a mellow, acoustic, seated atmosphere and provided fans a chance to ask a few questions and for him to tell some inspirational stories. His message is one of inspiration and his words are as powerful as his music. Watching Matisyahu perform acoustically was a gift as he is a humble, ever searching musician and powerful individual capable of lifting you to another level of consciousness through his music and actions.